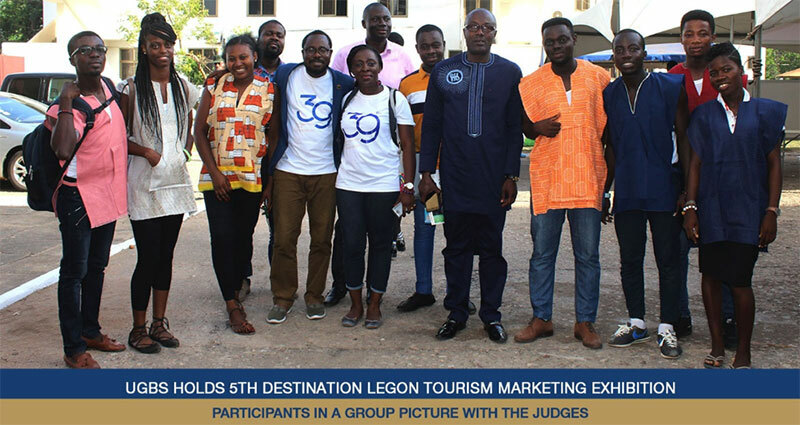 Students of the University of Ghana Business School (UGBS) have participated in the 5th annual Tourism Marketing event known as 'Destination Legon'. Partaken by level 400, MBA and MPhil students offering Tourism Marketing at the Department of Marketing and Entrepreneurship, this year's event took place on the 27th April, 2018 at the Executive Hall and the Executive Square. Presentations for the event dubbed 'Ghana beyond Aid: Enhancing the Digital Space for Tourism and Growth.' were held at the Executive Hall and the exhibitions at the Executive Square. The purpose speech delivered by Dr. Raphael Odoom highlighted the rationale behind the event as an active effort to enhance students' understanding of marketing a destination. Dr. Kobby Mensah, who delivered the welcome address commended the organising and student body for the incorporation of practical knowledge into classroom work to equip students with practical preparation in Tourism Marketing. The panel of judges for the event were Yvonne Eyeson; Sales and Marketing Manager of Fiesta Royale Hotel, Mr. Agbeko Lotsu, an Entrepreneur and Tourism Expert, Mr. Yaw Odame Gyau; Lecturer at Ghana Institute of Journalism (GIJ), Mr. Gilbert Abeiku Aggrey popularly known as Abeiku Santana; a media personnel and Tourism ambassador, Akua Poku Koli, a lecturer at the University of Ghana Business School and Mr. Kojo Bentum Williams, Senior Editor, Voyages Afriq. Accra in 3D, Amazing Ada, Hidden Eden, Nzema ye f3, Old Ghana Empire, Rendezvous, Sun Up to Sun Down, Taadi Wongye, Team 360 and The East Experience were the ten competing teams given the task to unearth and market various tourist destinations in Ghana with appealing messages and demonstrations to potential tourists. The judges encouraged students to take the opportunity provided them seriously and commit themselves in turning their initiatives from mere academic presentations to business opportunities to create jobs for themselves and others. As part of the exhibition exercise, students were required to display their chosen destinations within Ghana with the aid of pictures, videos and other relics to demonstrate which site is the "hotspot" for potential tourists. This year's challenge was won by the group Hidden Eden.